I am honored to be teaming up with Robyn from http://simplyfreshdinners.com/ to bring you a gardening and recipe series. 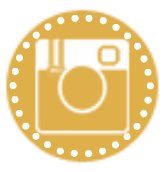 Posts will appear simultaneously on both blogs. I will be sharing some gardening tips and she some garden-inspired recipes. We hope you will follow along with us. Whether it’s a conscious choice to live a healthier lifestyle, with a diet rich in fruits and vegetables, the rising cost of fresh produce due to this year’s drought, or desire for non-genetically modified organics, first time gardeners are literally taking root. If you have been considering a garden of your own, a simple way to get started is with container gardening. It has never been easier to go organic than in containers filled with rich soil. There is also a much lower incidence of disease or insect damage when using containers than with in-ground gardening. Containers are perfect if you are short on space. You can use them on patio, decks and even balconies. It is also a convenient form of gardening for those with mobility problems, arthritis etc. as the containers can be placed on tables or stands for ease of access. The number of containers is limited only by your own imagination. You can choose from the endless varieties of terra-cotta, lined metal, wood and (if you live in a warm climate) pottery. You can also find cement pots and, a favorite of mine, half whiskey barrels. Of course the latter two will be hard to move after filled so keep that in mind. 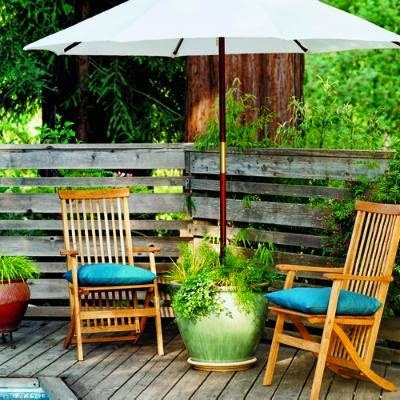 Don’t overlook wicker baskets, old tea kettles, discarded metal buckets and more. Consider what will suit your climate, clean thoroughly and be sure to add holes for drainage at the bottom. Keep in mind that a small container will hold less and require more watering. A medium to large pot will leave more room for the plants to spread their roots and require less water. If you find your container is the perfect width but is pretty deep you can fill the bottom with third or without with gravel or rock to save on cost of soil. If you are concerned with the possibility of leeching chemicals I would avoid packing peanuts and plastic pots (many people use both) and stick to more natural materials. Starting now, your local nurseries and garden centers have racks and racks of seeds and (depending on where you live) little seedlings ready to plant. If you want instant gratification go with seedlings. If you are the more patient type give seeds a try. They are the most economical choice and I am amazed every single time a new bit of green pops up. You can even do a mix of seeds and seedlings. 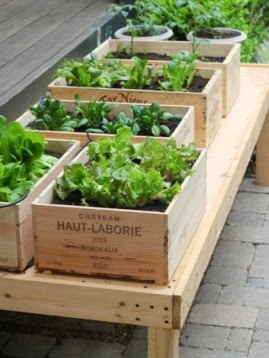 A fun and easy container idea is to do a “salad” garden anchored by a variety of lettuces in reds and greens. Add some radishes, maybe some arugula and even some edible nasturtiums or pansies for color and or topping your salad with. Be sure to check the seed packet or check with the nursery attendant to be sure the flowers are in fact edible and have not been treated with pesticides. Harvest the tender lettuce leaves by trimming them with scissors when plants are young and they will keep producing. You can also add more seeds to have a continuous crop available. Salad gardens like the cooler weather as does spinach which is also another great container plant. As the weather warms (hooray! ), you might consider sun loving vegetables like carrots or maybe some bush beans. If you are thinking tomatoes the cherry tomatoes are a better choice for a beginner than the larger tomato varieties and just one potted plant can produce quite a crop! In addition to vegetables, strawberries in a hanging basket, barrel or pot is also a great addition to a container garden. Once you get your feet wet with container gardening you can branch out into many vegetables, maybe a blueberry bush in a barrel or even a dwarf fruit tree. 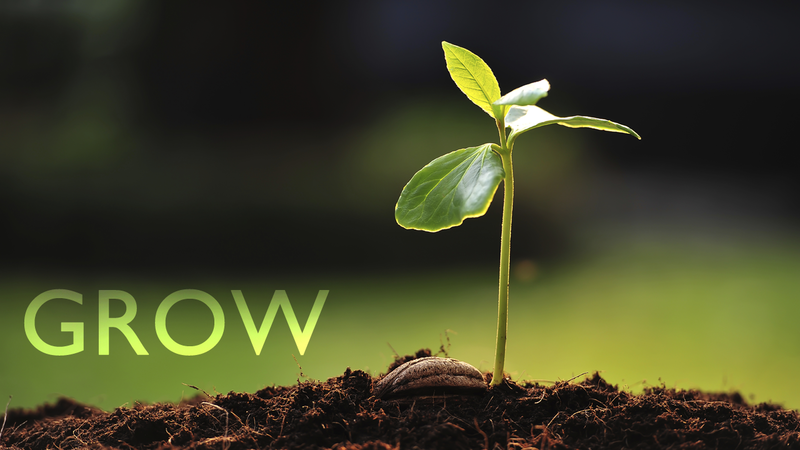 Be sure to read the seed packages or seedling tags for planting instructions regarding depth for planting and spacing as well as for location (sun/shade or a combination) of your container. I have also learned the value of the trained staff at my local garden center (rather than the big box stores) who are willing to share their knowledge as well as their passion for gardening. Don’t be afraid to ask questions. I hope you are inspired to start a container (or many!) of your own. It’s fun, it’s easy and, with your first taste of home grown spinach or a sun ripened strawberry, you will find it is also very rewarding. Here’s are two recipes for those beautiful fresh vegetables and herbs that will be thriving in your containers. This salad may look mostly green but don’t be fooled. It’s flavors are diverse and sharp and there are many different textures. Delicious! 1. Bring a medium saucepan of water to a boil. Add snap peas and cook until bright green but still crisp, 1 to 2 minutes. Drain and rinse under cold water. Pat dry with paper towel. 2. Toast almonds in a small dry skillet over medium-low heat, stirring constantly, until fragrant and lightly browned, 2 to 4 minutes. 3. Whisk oil, vinegar, salt and pepper in a large bowl. Add lettuce, carrots, chives, tarragon and the snap peas and toss lightly. Sprinkle with almonds. 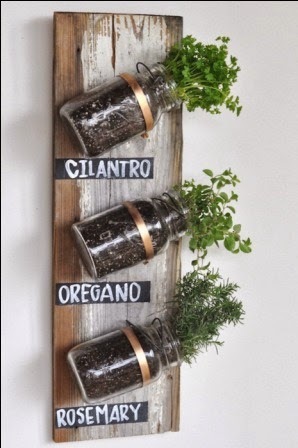 What great tips for container gardening Mindy, love the herbs in the jars, so clever! 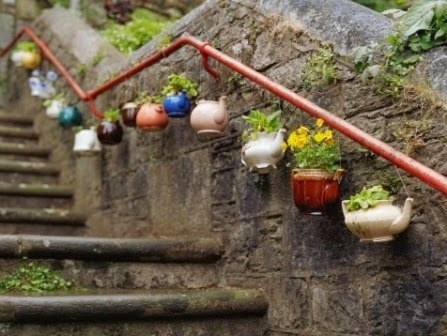 Hi Cheri, Robyn found the herb jar idea - I think it is so cute! Great Post Mindy. I love all the container gardening tips. I live in a high rise apartment with a balcony so my only chance to garden is in containers. 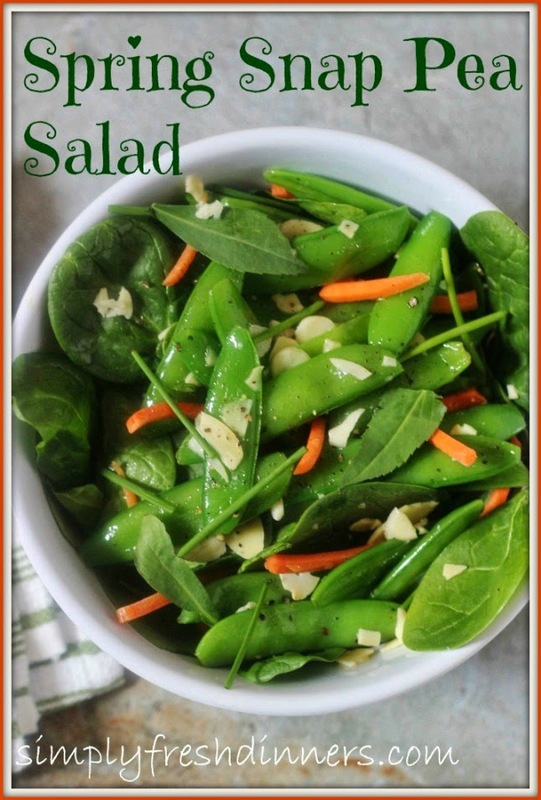 I can't wait to try the snap pea salad it looks so fresh and green. 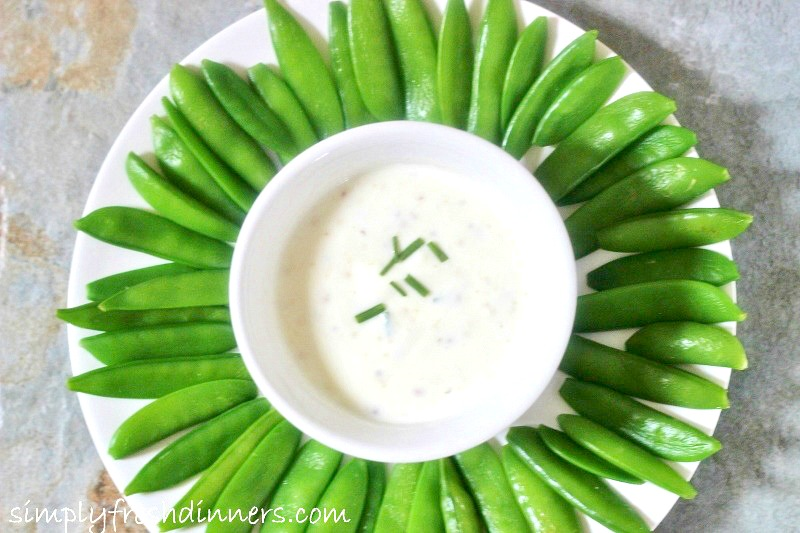 Snap peas are one of my favorites! The bush varities actually are good container plants as well and like the cool weather. Thanks for visiting! Hi Mindy! What a labor of love this post is today. I love all the different kinds of pots for the herbs. Those side-slanting canning jars are just amazing! The tea kettles were wonderful too. I don't use tarragon much, maybe this recipe will reintroduce it to me. I love almonds (almost any nuts really), so that's no problem. It looks delicious, and good for me too. Carey, you finally were able to comment! Thanks for reading friend - means so much. We have a big herb garden each year. I love to make pesto and dry lots of herbs for use during the Winter months. Love the herbs in the jars. So cute!